If you have just happened upon our event today, please begin your journey on the myStamp BOX blog here. All of our wonderful myStamp BOX designers are joining us today to show off some inspirational BOX creativity! We are giving away an amazing prize package from the myStamp BOX shop for our event this weekend and all you have to do is COMMENT along your journey to WIN. 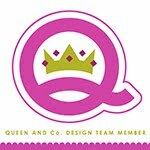 We have given three of our lovely designers a mystery prize box and you could WIN the prize inside just by leaving a COMMENT on EVERY designer’s blog. Our Mystery Box Hop winner will be announced on the myStamp BOX blog on Monday so all comments are due by Sunday June 26th at 11:59pm EST. Good Luck! 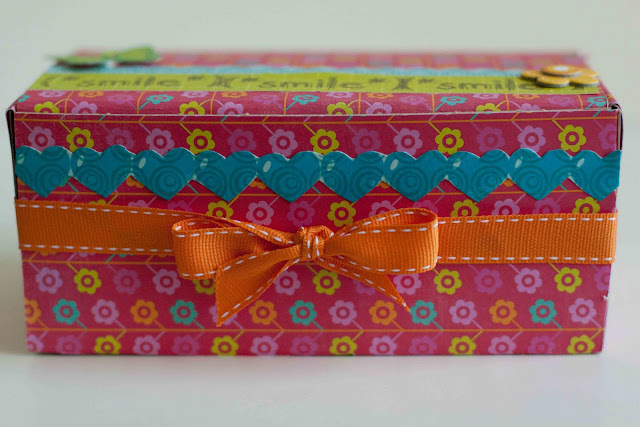 I started by covering the box with patterned papers from Echo Park. 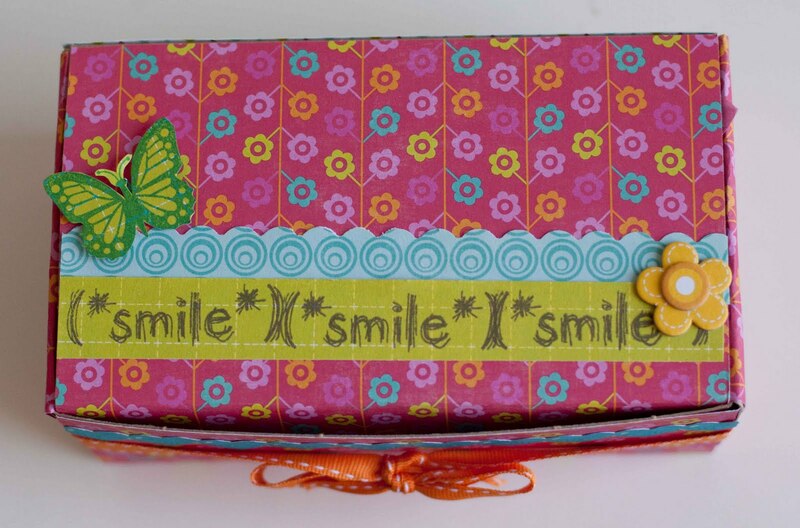 Then I stamped (*Smile*) from the Sigh Gush Gasp collection and adhered it to the lid with a punched border. I added a butterfly from the Colorful Companions collection. Next I stamped a border of hearts with a little heart from the Symbols collection. 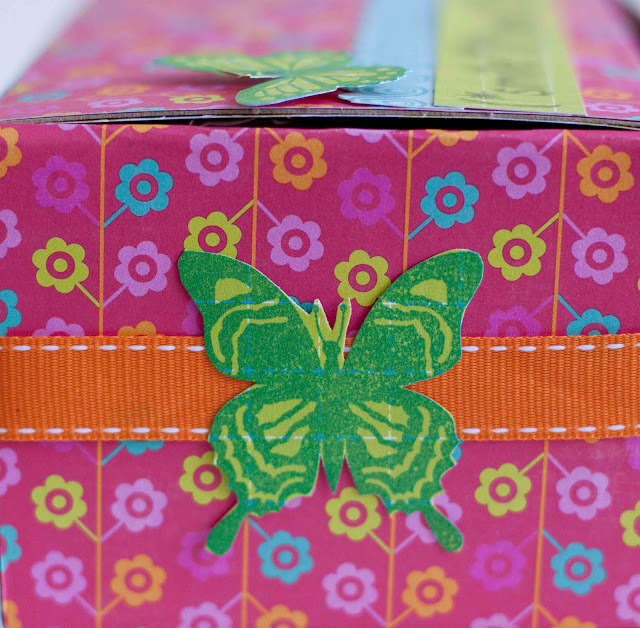 For both sides I stamped another butterfly from Colorful Companions. And here is the little butterfly post it book and pen I bought from the Target dollar spot all wrapped and ready to be given to my daughter. Now it’s time to HOP along and find out what the next talented designer has created with their MYSTERY BOX. Your next designer is Marsha Valk. Don’t forget to leave a comment below for a chance to WIN one of our MYSTERY BOX giveaways! Oh it's adorable!! I love butterflies!! It's beautiful and colourful and I love the inside. Such a happy box!! Love the colors! I can see a teen girl really loving that box. Such fun and happy colours! sooooooooooo cute!!! what a great little birthday box. So cute to keep the theme going all the way through! wow, i love the repetition of everything! the colors make me smile and the goodies inside do too! Super duper cute Rebecca! Love your lines of stamps! Great job! Adorable! So pretty in pink! 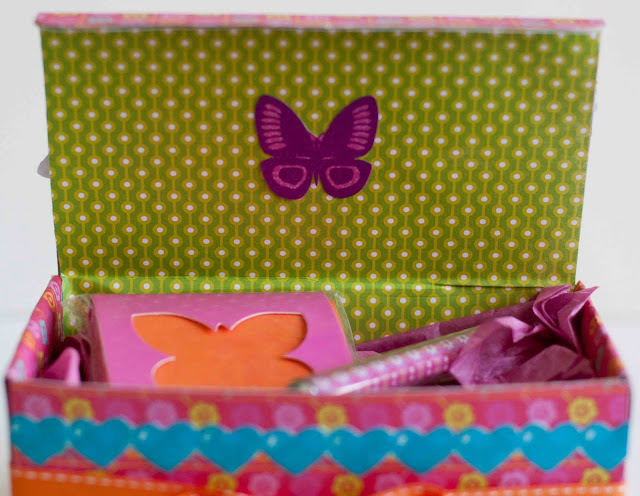 oh, what a fun and colourful box! 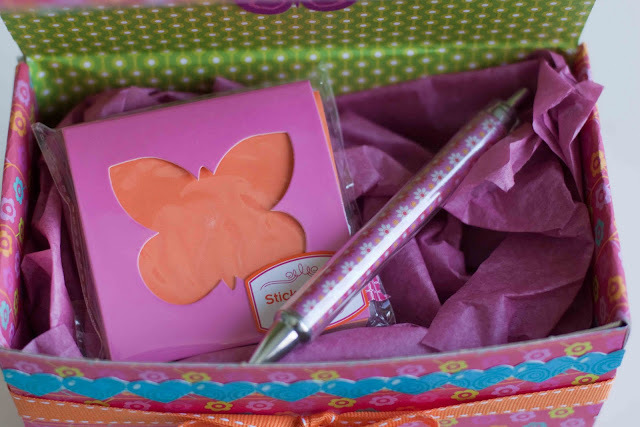 This is really cute and a perfect gift for a little girl! Love, love this box! Colors are just gorgeous! I love the Echo Park Desings The colors are so bright. cute! Great project Rebeccam I love that smile sentiment that is one of my faves!! Love the bright, happy colours! Great inspiration! Just darling with the butterflies and heart border. Perfectly pairs to the Echo Park papers! Cute, fun and Happy. Love this box. Perfect for my little one.